All fields required for entry. Help me Rise + Shine! 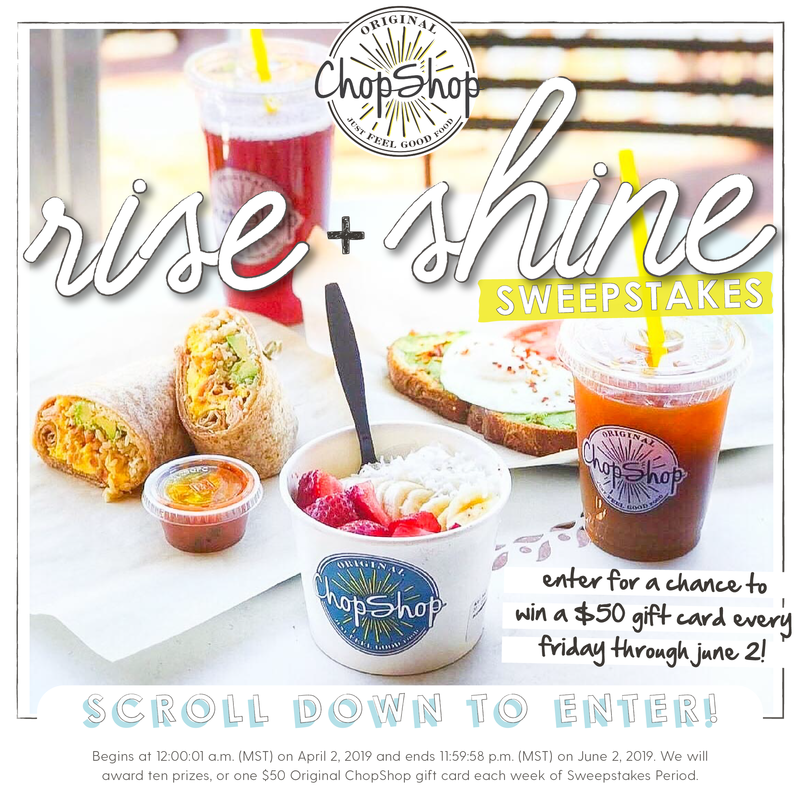 Please read these rules before entering the Original ChopShop Rise + Shine Sweepstakes (the "Sweepstakes"). You agree that, by submitting an entry, you will be bound by these Official Rules and you acknowledge that you satisfy all sweepstakes eligibility requirements. If you are an individual legal resident of the 50 United States (including Washington,DC), you are eligible to enter the Sweepstakes. Our employees, their immediate family members (spouses, domestic partners, parents, grandparents, siblings, children and grandchildren), and our affiliates, advisors or advertising/promotion agencies (and their immediate family members) are not eligible to enter the Sweepstakes. Complete all required fields in entry form. We will award a total of ten (10) prizes, or one $50.00 Original ChopShop Gift Card ("GC") each week of Sweepstakes Period. The GC is redeemable for food and beverage at any Original ChopShop company owned location (offer will not apply at licensed location in PHX Sky Harbor Terminal 3). The GC cannot be reloaded, resold, transferred for value, or redeemed for cash. If the GC is lost or stolen, it will not be replaced. Potential winners will be selected in a random drawing to be held on or about June 5, 2019, from among all eligible entries received during the Sweepstakes Period. We must receive eligible entries during the Sweepstakes Period for them to be eligible for the drawing. On or about June 5, 2019, Sponsor will notify the potential winners via e-mail. We may change these rules or cancel the Sweepstakes at any time; or modify, terminate, or suspend the Sweepstakes should viruses, worms, bugs, unauthorized human intervention or other causes beyond our control corrupt or impair the administration, security, fairness or proper play of the Sweepstakes or submission of entries. We are not responsible for: (a) lost, misdirected, late, incomplete, or unintelligible entries, inaccurate entry information, whether caused by you or by any of the equipment or programming associated with or utilized in the Sweepstakes, or by any technical or human error that may occur in the processing of entries or photos; (b) any printing or typographical errors in any materials associated with the Sweepstakes; (c) any error in the operation or transmission, theft, destruction, unauthorized access to, or alteration of, entries, or for technical, network, telephone, computer, hardware or software, or application malfunctions of any kind, or inaccurate transmission of, or failure to receive any entry information on account of technical problems or traffic congestion on the Internet or at any website; or (d) injury or damage to your or any other computer resulting from downloading any materials in connection with the Sweepstakes. We may, in our sole discretion, disqualify any individual found to be: (x) tampering with the entry process or the operation of the Sweepstakes or website; (y) acting in violation of these rules; or (z) acting in an unsportsmanlike or disruptive manner or with intent to annoy, abuse, threaten or harass any other person. If your entry is incomplete or if you use robotic, automatic, programmed or similar entry methods, your entry will be void. ChopShop Holdings, LLC ("we" or "us"), 5601 Democracy Drive, Suite 209, Plano, TX, 75024. Privacy Notice: All information submitted in connection with this Sweepstakes will be treated in accordance with these Official Rules.